Hello all…happy belated Groundhogs Day to all you ‘mericans and early Valentine’s Day to my fellow romantics! Today I have some reflections on Zero Waste Living for you plus some tap dance related news and a bonus plant fact. 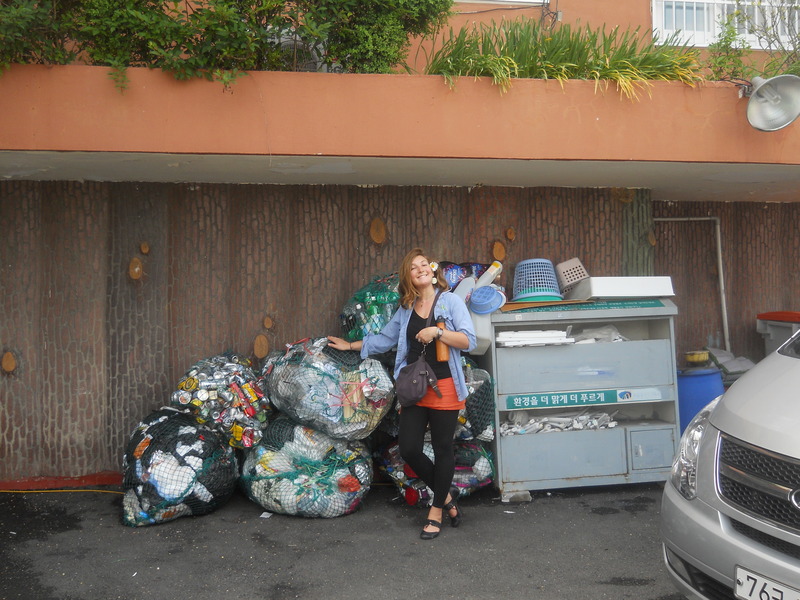 As some of you may know, I’ve been obsessed with garbage for a long time…see me and garbage through the years (cue love song: how sweet it is). I’m not sure what this fixation says about me psychologically–a topic for deeper exploration, I suppose–but I do know where this interest has led me, and that is to explore Zero Waste Lifestyle options in an effort to reduce personal waste production. This year I experimented with a few different dental floss options (Dr. Mercola is the new favorite, works best, comes in cardboard container, thanks Mamãe), switched over to a new deodorant that can be bought in bulk and comes in a glass jar (Meow Meow Tweet), bought “bees-wrap” to replace saran wrap, or “cling-film” as our UK friends call it, and both invested in a reusable-collapsible to-go container design I’ve been playing with for years…and found one that gets the job done (Sea-To-Summit “Seal and Go Set”). I also continued to use my To-Go Ware (bamboo utensil set), which I carry around religiously, also introducing metal straws to the mix, enjoyed the soft feel of cloth hankies to dab away tears and runny noses, brought my own totes and produce bags when grocery shopping, and went on with what is probably my 5th year of using the Diva Cup, a reusable menstrual cup which has enabled me to live pad and tampon free all this time. Not only has the cup prevented a lot of garbage and exposure to chemicals, but it as also saved a lot of time and money since I never have to buy pads or tampons anymore. Oh yeah, I also started making my own toothpaste using a simple recipe, eliminating toothpaste associated garbage which tends to be difficult to recycle and of course carry a reusable waterbottle so I don’t have to buy plastic ones on the go. If you’re curious about any of the topics mentioned above, please ask and I’ll be glad to elaborate. Reflecting on the areas I can still reduce waste, the first things that comes to mind are to-go cups (for coffee and smoothies/juices) and to-go food containers (for take-out and nuts). Deeper observation is needed to further analyze my garbage footprint and see where improvements can be made. Moving on, I wanted also to share some musical projects that have been happening. That was me and a friend playing around with time and sounds at the American Tap Dance Foundation. More to come! In other tap dancing news, Gregory Hines, legendary tap dancer who was most prominent in the 1980’s and ’90s and know for collaborating with male ballerino Mikhail Baryshnikov among other things, has been honored by the USPS by being put on a postage stamp. Woot! Here is a video from the dedication ceremony, held at Symphony Space in Manhattan last Monday. The dancers are Barbara Duffy, Michelle Dorrance, Mikela Lerman, and Ayodele Casel, dancing a piece choreographed by Gregory Hines. As far as street performing goes, I wanted to write a little about that world of experience. I have been doing this. I started last year and had the most fun dancing with my then-roommate, Martina the Ballerina. I find street performing to be a good way to work through the nerves of performing, receive feedback, and practice playing loudly, plus it give me somewhere to play other than my bedroom with less pressure than open-mics. When I street-perform (aka “Busk”), I either play guitar, acoustic or electric (acoustic is less cumbersome), or tap dance (either to recorded music, a metronome, or with nothing). 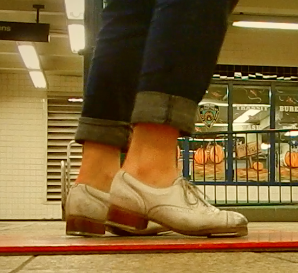 The goal is to combine tap dancing and guitar, and I haven’t quite figured it out yet other than stomping out 1-2-3-4 beats. Thought I’d have more to say about that but turns out no. Just wanted to introduce the topic. Simmer is a tomato sauce that comes in smaller package than other sauces on the market. It is meant to be a solution to moldy tomato sauce, which often happens when a single person opens a jar o’sauce. Even though his packaging is plastic, I thought it was clever to address the issue of portion sizes and food waste in packaging. He also had great sample spoons made out of cardboard instead of plastic. If any of you are thinking about giving out food samples, consider these. Plastic-free sample spoon, great idea! Finally, a plant fact for you that I learned at work. Ficus, a common house-plant, is a fig plant! I didn’t know that but it makes sense. According to Tina DeSanto of The World is Your Dumpster, also my co-worker at Verdant Gardens, Ficus binnendijkii ‘Alii’ is more commonly known as Alii ficus or banana-leaf ficus. Originally from the Philippines and south east Asia, this tree was originally cultivated in Hawaii and has been in the industry about 10 years, the name Alii means chief in Hawaiian and ficus in Latin means fig. And finally finally, a dream catcher I made out of plastic bags and odds and ends I’ve collected in the past few months from life and litter.